eMode From Joyetech – “Revolutionary”? 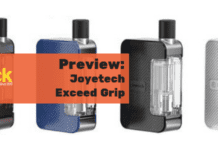 Joyetech have been at the forefront of electronic cigarette design for a number of years developing the likes of the EGO e cigarette that has proved to be one of the best known vape devices available today. The eMode has taken another step towards creating something new in the e cig world, reportedly in development for 12 months they have designed an e cig that provides a “superbly engineered single entity that delivers all the requirements that even the most critical and seasoned ‘vaper’ could expect”. So a lot of talking the eMode up by Joyetech but the proof is in the pudding so to speak. We popped on over to the official Joyetech website and purchased a complete kit. On with the eMode review. The Joyetech eMode comes in a professionally designed tidy presentation box. The eMode is powered by a 16650 2100mAh SANYO battery that is housed within a solid metal tub, it’s available in black and brushed steel. I opted for the black which has a nice glossy finish to it, it feels good to handle and the device as a whole has a nice weight that further adds to the overall feel of a quality device. Very solid. The only thing that did get on my nerves was having to constantly rub my grubby fingerprints off, it does pick them up and show quite easily. Or maybe I just have extra sweaty palms! The actual battery life is great and should be fine for 99% e cig users out there. As a moderate vaper I was getting a couple of days vaping in before needing a re-charge. The battery itself is topped with what Joyetech call the eMode Control Head, as the name suggests this is where the all important gadgetry is housed that will help you get the best out of your e-liquid. The Control Head has the variable voltage and variable wattage options but on top of this there are also two other functions, RVV/RVW which operates by way of the MVR (My Vapour Record) software. It also has the thumb wheel that allows you to scroll though the wattage/voltage settings. The voltage ranges from 3.3v-4.8v and the wattage from 4.5w-11w. As mentioned previously the control head is in essence the heart of the eMode, this is the part that determines how you vape. The two operating modes needed are the VV/VW selection and the rotating wheel to select the required voltage or wattage. All very straight forward and easy to operate and understand. The power button has the standard 5 click on/off function but unlike other similar devices I have tried the VV/VW selection process is slightly different. Selecting what mode you would like to use is done when the e cig is ‘turned off’, selecting the mode you want is done by keeping the power button pressed, this will then highlight the various VV/VW functions, simply stop at the required setting. Then just turn the e cig back on by clicking the button another five times. RVV – This mode is linked to your pre set voltage settings in the MVR software. This is set within the software to your specification and when selected on the control head will set the eMode to vape using these settings. RVW – This mode is linked to your pre set wattage setting in the MVR software. There are three settings you can configure based on your vaping preferences, the idea behind this is to use the three settings tailored to be used with three different juices. Each of the modes are then put into action by using the thumb wheel at the base of the control head. This rotates 360 degrees through voltage (3.3v-5v) and wattage (4.5w-11w). Not only does it have a very smooth action but has the all important (for me) satisfying ‘click’ when each point is reached. The big difference with the eMode to other ‘variable’ devices is the access to the MVR software that opens up a whole host of settings as well as recording data about your vaping habits. Users of the eVic will be familiar with the software as it is compatible across both models. The software does take a short while to get your head around but can be interesting seeing graphs displaying how much you are vaping on a daily basis. There are also settings that will control the amount you vape as well, so if you want you can set a ‘maximum’ puff count per day in the software and as long as you have the correct setting on the eMode then this will limit the device to your settings. Useful maybe for those wanting to cut down or regulate what they vape? I’m still playing around with the software but I personally can’t see me using this all that regularly, I’m happy enough controlling the device manually and just getting on with vaping. For those that are into their stats and like to see a pattern in the way they use their e cig then this and the other features will no doubt be really useful. Last but not least the USB port is located on the control head as well. This is used to charge the device and of course sync with the MVR software. There is a little rubber stopper that goes into the USB port when not in use, luckily they supply a few spares of these as I had lost mine within 2 hours of taking it out! Maybe having it connected to the battery so it doesn’t come out fully would be a better idea. Both the Control Head and the battery components are replaceable and available to buy on the Joyetech website but the control is pricey so you might want to take care not to damage that! The battery life is great and the control head houses a multitude of features especially when the MVR software is put to use. For me though I can’t, at the moment, see me going back to the software repeatedly but for the vapers out there that love there stats then this will be a great feature. As for the practical side of using the eMode, the VV/VW features are easy to switch between and the thumb wheel itself has a smooth action that is a pleasure to use. Joyetech include one 10ml bottle of e-liquid with the eMode, the choice is pretty big with an array of tobacco, fruit and dessert e juice flavours to choose from ranging from zero to 16mg nicotine strength. So something for most tastes there although most users of the eMode will likely have a regular e-liquid already. The tank design certainly looks the part when complete with the eMode body but the proof is in the pudding as they say! The tank itself is very easy to fill with the use of the two inlet holes at the top of the tank, simply place the e-liquid bottle tip into one of the inlets and drip the juice in, no need for needle tips it fills the tank in an easy and mess free manner. There is also a window to get an idea of remaining e-liquid levels, this is plastic though and would have been good to see a pyrex window. The C2 atomiser head also connects easily, simply twist this into the base and then screw the base into the bottom of the tank. This is done prior to filling with e-liquid but once in the atomiser sits submerged in the e-liquid. A great feature on this tank is the airflow adjuster that allows even more control over your vape. Joyetech supply a small key with the kit that you can use to adjust this based on what you prefer, I personally like a more free flowing vape rather than the tighter draws and it performed this very well. I tried a number of vape liquids in the eMode, one being the Totally Wicked Green Apple and the other being the Double Mint from Joyetech. The flavours of course differed with the various settings. I personally find myself going back to the wattage mode as this produces the best flavour for my taste buds. It did do a very good job of not only providing a nice clean flavour on both the e-liquids I tested but the vapour volume was also great. I was getting plumes of vapour from both the VV and VW settings. Replacement eMode atomiser tanks are available to buy at Joyetech and while I couldn’t see the C2 atomiser heads available on the website at the time of writing Totally Wicked do sell these in a pack of 5. They have a license to sell this e cigarette under the name E-Lectron-S. Overall – The C2 atomiser performed very well helping my e-liquids produce a great flavour and a tonne of vapour. The air flow adjuster is a great feature that adds further to perfecting your vape. The only thing that some may find as a down side is the tank uses a plastic tank rather than pyrex. Joyetech offer a 7 day return on unopened product in its original condition. Warranties cover specific parts of the eMode ranging from 60 days to 12 months. Please see the Joyetech website for upto date T&C’s. Available by email and active on Facebook, Twitter and Google+. There is no phone number though to get in touch with them which is surprising with a company like Joyetech. As soon as we have a discount code available we will post it here. Overall – Or For those that Skip to the end! The Joyetech eMode e cigarette has many things going for it but the first thing you notice once it is assembled is the length. At just over 18cm it is a BIG electronic cigarette. Having said that I still find it slips in and out of my pocket with ease even if there is a bit of the mouthpiece protruding. There is also a bit of weight to it but it does feel very solid and the excellent build results in a quality feeling device. The functions of the eMode (VV/VW) are very easy to navigate and I personally prefer the rotating thumb wheel for choosing what wattage or voltage to vape at rather than the digital display the likes of the iTaste employ. This doesn’t mean to say it is lacking technologically, far from it, the MVR (My Vapor Record) software that the eMode is paired with really is a step forward in the world of vaping allowing you to program certain settings on the e cig and keep a track of your vaping habits. Users of the eVic will already be familiar with MVR. This of course isn’t a feature for everyone, I for one will probably only use this once in a blue moon but for the vapers out there that love their stats and keeping a record of what they are actually vaping then this could be a good selling point for you. On the performance side I found that the eMode did a great job of delivering not only good flavour from my e-liquid but it also produced masses of vapour. The only downside for some vapers may be the plastic tank window as opposed to using pyrex/glass as some e-liquid flavours have been known to crack the plastic tanks. The e cig itself picks up fingerprints very easily in the glossy black finish so if you have a bit of OCD when it comes to cleaning things then I would suggest sticking with the brushed steel model. Last but not least the price could be a sticking point for many. Overall though I really enjoyed using the eMode!